Give your Honda the kick it needs! Meant as a drop in replacement cam for your small but sprightly Honda Fit or Jazz! Even though we specialize in other cars, these camshafts have become our best selling special order camshaft, with repeat orders from tuning shops around the world. Both of these Cat Cam grinds are specifically designed to uses all OEM engine components for a drop in upgrade you can quickly enjoy. All of these cams are made from NEW BLANKS, never reground cores for the best reliability and performance. With these latest Cat Cams, you can still maintain all the excellent virtues of your Honda with the extra performance you are craving! High quality and Cat's engineering mean performance and durability you can trust. Tuned for a broad street-performance power band, you get more midrange and high RPM punch while keeping good torque giving your Fit / Jazz a real sports car feeling. 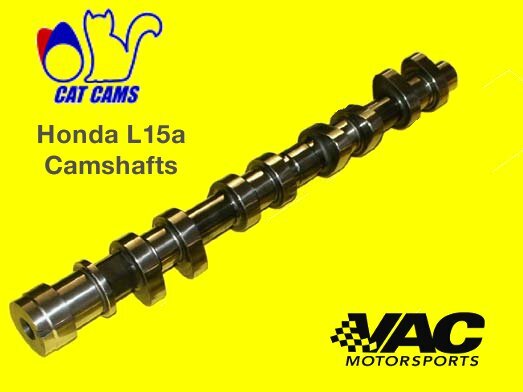 We can tell you, though they are little known outside Europe, Cat Cams makes some of the best performing camshafts we have seen. They even private label some of our VAC BMW camshafts and we have had excellent results in both street and racing use from their camshafts... Our name is on them, we want the best too! Includes camshaft, and cam spec card for installation. These cams are made to order, please allow 2-4 weeks for typical production. 263 / 259°: Street Grind; great for daily driver. Drop in and enjoy more power with little to no compromise. Makes mods like intake and exhaust offer a better power gain! Also works with supercharged engines (tuning recommended with supercharger). Typically a 9-11WHP across most of the powerband is gained... Feels great! 290 / 272°: Sport Grind; More aggressive with even better power gain for naturally aspirated enthusiasts. We recommend that this cam is used with ECU tuning (like a Greddy E-manage). Expect up to 11-14WHP gains with proper tuning on an otherwise stock engine, more with other mods. Techs Install Tip: When installing new camshafts, we recommend replacing your used lifters with new OE Honda lifters at the same time. Cam image shown for example, actual product varies in appearance. From Nam of Nonthaburi, Thailand on 6/27/2013 .